Uniting the community and making our younger residents feel that they have a safe place to turn can be challenging, even in our welcoming town. Enter New Castle United for Youth (NCUFY). Formed in 2016 as an outgrowth of the Coalition for Youth (CFY), NCUFY is a supportive, encouraging resource that uses youth-focused strategies to promote a safe and healthy community. The committee’s founding members, Steering Committee Chairperson Lea Barth and Steering Committee members Leslie Kuhn and Victoria Goodman, were originally members of the Chappaqua Central School District’s R21K PTA Committee. 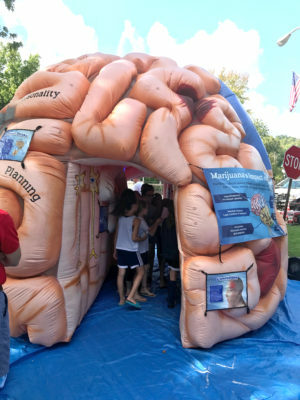 They started attending the monthly meetings of the Westchester Coalition for Drug and Alcohol Free Youth and soon realized they could re-invent the Town of New Castle’s drug prevention committees following this model. Working with members of the community, CFY applied for the federal Drug Free Communities grant which was awarded to CFY in 2016. This grant gives the Coalition $125,000 a year, renewable annually for up to ten years, to fund prevention work in the Town of New Castle. “Our goal is to promote a positive message and help students and teens feel empowered to make positive choices. We want them to feel confident making social choices that are right for them,” says Barth. To achieve this, NCUFY brings together parents, youth, the Chappaqua School District, the Town of New Castle, police, local businesses, medical professionals, local media, religious organizations, and others to work together to apply data-based approaches to influence the way kids make social decisions. “We are fortunate to live in an open and accepting community. Our kids have the capacity to accept the choices of others,” states Kuhn, who has helped to spearhead several initiatives to engage local teens. Last October, NCUFY partnered with the school district to bring the motivational speaker, Ty Sells, to Horace Greeley High School. Sells discussed the importance of developing positive relationships, and the value of open conversations between parents and children about drugs and alcohol. Dr. Steven Dewey, a NYU Medical School neuroscientist and researcher was another guest that NCUFY invited to speak at Greeley’s iLab and science research classes this spring. He helped elucidate the science behind the impact of drugs and alcohol on a teenager’s brain. The NCUFY Steering Committee lauds the efforts of the Town of New Castle, which they find to be exceptionally helpful to and supportive of NCUFY’s initiatives. The town raised age restrictions for buying vaping equipment and cigarettes to 21; smoking is prohibited in town parks; and the town has prevented vaping stores from renting space near Chappaqua schools. “Rob Greenstein is a doer. He is consistently supportive and responsive. So is Jill Shapiro,” notes Kuhn. And NCUFY is growing. “When we applied for our initial grant, our objective was to change people’s perceptions about teen alcohol use, hopefully reducing the amount of teenage drinking,” notes Barth. Now, they are working to increase their social media traffic, to continue increasing partnerships within the community, and to get across their consistent, positive message of preventing substance use and abuse. Long-term, the Steering Committee hopes to build something that is sustainable; they want to build something that can be passed down to a new generation of New Castle’s parents, administrators, and influencers who can support this community’s youth. While the Coalition has yet to determine whether they have encouraged a substantive behavioral change in New Castle’s youth, Goodman says, “All of this started a great conversation.” Hopefully, this conversation will resonate throughout the community. Spend an afternoon with local Boys and Girls Club of Northern Westchester (BGCNW) CEO Alyzza Ozer and Director of Teen Programming Athenia Lee, and you’ll see that mission in action. Arrive at 3 p.m. or so and witness area school buses rolling up to the BGCNW front door, and kids of all ages, ethnicities and backgrounds jumping out, eager to take part in a myriad of the club’s after-school programs. 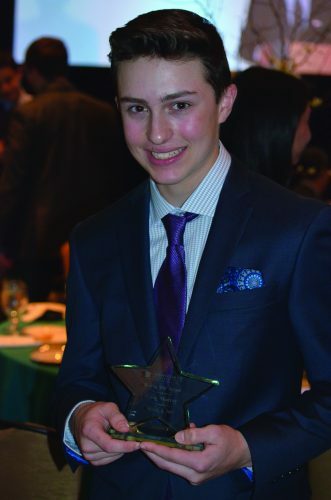 One such program, the prestigious High School Youth of the Year competition, recently concluded its local awards. 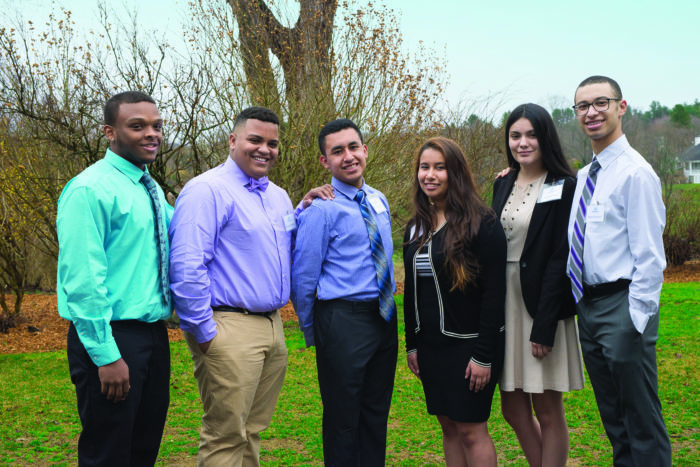 From the six Club kids (see Finalist Group Photo here) chosen as High School finalists, Tatiana Restrepo was awarded Youth of the Year and Rolando Trinidad was named the Chris Cutri Memorial Award recipient. After this edition went to print, Tatiana competed in a state-level competition in Albany. Historically, this state level sees approximately 45 competitors, each of whom has the chance to cap their previously submitted packages of background information with a prepared speech before a panel of judges. The winner of the state competition goes on to the Regional competition and the Regional finalists all get together to compete one more time in Washington DC. Ultimately, the winner in DC will begin a one-year term as teen spokesperson for all the Clubs’ members nation-wide. How does a BGCNW member become eligible for High School Youth of Year? According to Ozer, the requirements (for any student in grades nine through twelve) are one year as a Club member plus 25 hours of community service for the year. However, Ozer is quick to point out that “most kids have much more.” She goes on to explain that the opportunities to give back to the community begin with preschool and continue on through the years, ultimately culminating in the youth leadership group known as the Keystone Club. 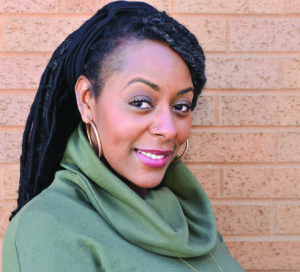 Adds Lee, a BGCNW Club kid herself and now, eight years into her position as Director of Teen Programming, sees herself as a mentor to all those following in her footsteps, “Some kids are eager to apply, others are reluctant and we need to encourage them. We largely let them self-select, but there’s a whole long application process and some need more encouragement than others.” She adds that, in some cases, the fear of public speaking gives pause to many a qualified student, so part of her mentoring goal is to help those students open up and trust that they have something worthwhile to share. Whether one-on-one or through some of the other Club programs, teens are empowered to find their voices. In fact, Tatiana recently made her final college decision and will be attending Pace University come fall. She is proud that, like her older brother, she is part of her family’s first generation to attend college. Cutri Award recipient Rolando is equal parts humble and proud of his honor too. A young man with a strong and confident demeanor and handshake, he too reflects upon his time with the BGCNW, saying “the Club has allowed me to show leadership and achieve my goals. In particular, Mr. Cutri has given me confidence to be strong and stand up for my beliefs.” Rolando plans to attend Manhattanville College where he will study sports business with the ultimate goal of becoming a sports agent. National statistics have repeatedly shown that, from preschoolers on up through high school, children who participate in Boys & Girls Club programs perform better in school and make smarter life choices. Whether they are official Youth of the Year honorees or simply moving forward as more focused students, participatory community members and contributing citizens, BGCNW kids, without doubt, all deserve a round of heartfelt applause! Check the Boys and Girls Club website, www.bgcnw.com, for the update about the state competition. Greenwich, CT – A Focus on a Cure in March was an evening of dining, auctioning and, most of all, awareness for Crohn’s Disease and Ulcerative colitis for the Crohn’s and Colitis Foundation. These diseases, like many others, are not visible on the outside so it’s difficult for many to understand the toll it can have on one’s body. While it appears invisible on the outside, it’s wreaking havoc inside. Guests had the opportunity to hear in depth about the struggles of Crohn’s and colitis through speeches given by Jeremy Schaap of ESPN and our own Horace Greeley junior, Greg Murray. Greg was diagnosed around his second birthday with ulcerative colitis. For the past 14 years of his life, he has been meeting with doctors from different states and cities, going through many procedures and changing medications. Having his first colonoscopy at only 20-months old, Greg had all the usual symptoms of a UC patient. Since his diagnosis, Greg has been dealing with constant flare-ups: really bad stomach aches and cramps. Some days he has been better than others but despite all his pain, baseball is what has kept Greg feeling normal and continuing his life like any other kid. He’s played the sport all his life and has been dedicated to the Greeley baseball team as well. Not too long ago, Greg underwent three surgeries over a period of five months after conventional medicine failed to help him. Surgery restored a sense of normalcy in Greg’s life, and of course, allowed him to play in the final two games of his baseball season. “Here I am today and I feel great. It’s a relief not having to take any more medicine on a daily basis. My dream to be able to go away to college and play baseball is now possible and I am excited about my future,” he said. For this bravery and tolerance throughout his life, Greg was awarded the 2017 Rising Star Award, and walked off with autographed gear from his favorite teams. The event raised over $550,000 to benefit the Crohn’s and Colitis Foundation and research to find a cure. If you’re interested in becoming involved, don’t hesitate to email Lisa Harding lharding@crohnscolitisfoundation.org or visit chronscolitisfoundation.org to find out about programs and events. Molly Alexander, a junior in the LIFE School at Horace Greeley High School, is an intern for Inside Chappaqua and Inside Armonk Magazines this spring. 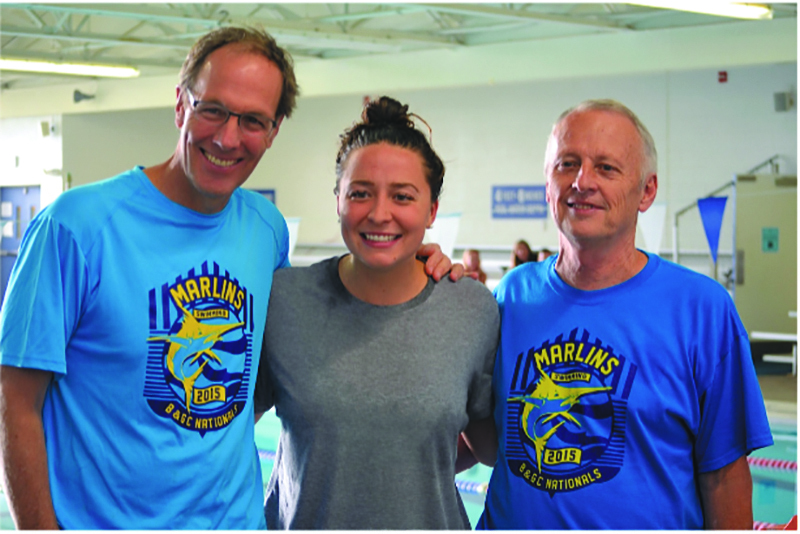 Boys and Girls Club Marlins’ coaches Bobby Hackett (Distance Coach), left, and Dennis Munson (Head Coach/Aquatic Director), right, welcome Olympian Ariana Kukors. Never underestimate an Olympian! When she retired from swimming in 2012, Ariana Kukors set out to use her experiences to inspire change in others. From kids’ clinics and corporate presentations, to her role as Director of Health Inspiration at LifeWise Health Plan of Washington & Oregon, Ariana has been able to engage, encourage, and motivate people from all walks of life. As she set out to work with over one hundred of our local athletes during the last weekend in September, I was in awe of just how much valuable information, pertinent to performance, could be included in a 2-2.5-hour workshop. I knew the workshops would be inspiring and insightful, but I didn’t realize that they had the potential to be life changing. Ariana’s first Westchester workshop, graciously hosted by the Bristal in Armonk, was a Dream Clinic for teens looking for targeted ways to become better at their craft. The teens were everything from equestrians to soccer players, with obviously some swimmers in the mix. Ariana began by telling the story of how she was a member of the National Swim Team since age 13, and that her first crack at the Olympics was in 2008. She candidly described the details of finishing the semi-finals in first place, but sinking to third place in the final lap of the 200 IM. One doesn’t have to be a swimmer to know that coming in third by .09 seconds is a devastating experience. The ensuing night was rough, but beginning the next day–after dropping a full 9 seconds in the 200 breast–she began to develop a comeback plan. The clinic was an opportunity to explore one’s personal philosophy and vision with a suggestion to develop a vision board for life. The teens learned about positive self talk, mindfulness, and steps to calm the mind through meditation. She explained exactly what techniques she employed in order to break the world record, not once, but twice to win the gold medal at the World Championships in Rome in 2009, being named American Swimmer of the Year by Swimming World Magazine. The teens worked on their own personal ideas during the session and left with techniques to complete a comprehensive plan for success. One parent let me know that her daughter didn’t waste any time putting elements of the plan into practice, scoring points for her team in a competition the very next day. 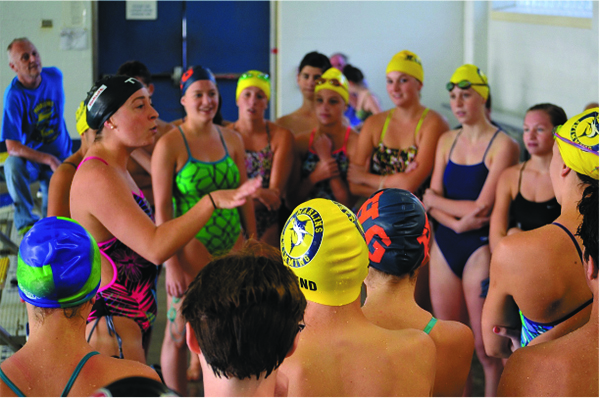 Ariana gives tips and advice to a rapt group of competitive young swimmers at the Boys and Girls Club in Mount Kisco. That Sunday, Ariana conducted swim clinics at the Boys and Girls Club in Mt. Kisco. Again, she began with her story, which every swimmer in the room could relate to as she spoke. “Who has had a bad race?” Again, she described that fateful race of 2008 where years of training kept her in first place for the first 150 meters. She described how panic set in as her mind strayed to the thought of being chased down by freestylers who at moments in the past had been flat out faster than her personal best time. Her honed technique fell apart as she panicked. Everyone in the room identified with her at that moment–including swimmers I had seen repeatedly take first place at Metropolitan Swimming championships. It was her absolute humanness that drew them in to her world. Every swimmer has had the race where they put themselves out there only to touch the wall and look back at the clock to see that they fell short of their goal. There were questions about strategy, mental preparation, opponents, and how to pick an element to develop to drop their times. There were moments of laughter and moments where she tugged at their heart strings. For much of the afternoon she was in the pool with them working their strokes in new sets and drills. In the end, all of them had their opportunity to race an Olympian while swimming their best stroke. As the session closed, I could see that they had fallen in love with Ariana as they all stayed for photographs, autographs and even more laughter. The afternoon brought me back to thoughts when, as a family, we met Ariana at the Olympic Trials. She had realized her dream of becoming an Olympian in a race that we watched on the edge of our seats the evening before. 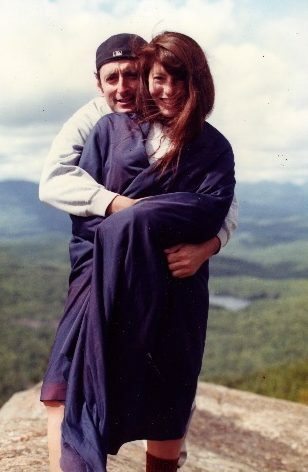 Little did we know in that moment as she touched and placed second–erupting in tears of joy as she connected with her family–that she was destined to take a place in our hearts. I knew the kids at the workshops would love her too, but what I learned is that she is truly as amazing outside of the water as she is in the pool. She put her heart and soul into the preparation for these clinics and once again, it paid off as a true gift for everyone involved. We can’t wait to have her back again! Susan Draper is currently pursuing her RN degree while teaching yoga and spinning in her spare time. She lives in Armonk with her husband, daughter, and competitive swimmer son who inspired the whole family to “dive” into the sport eight years ago.